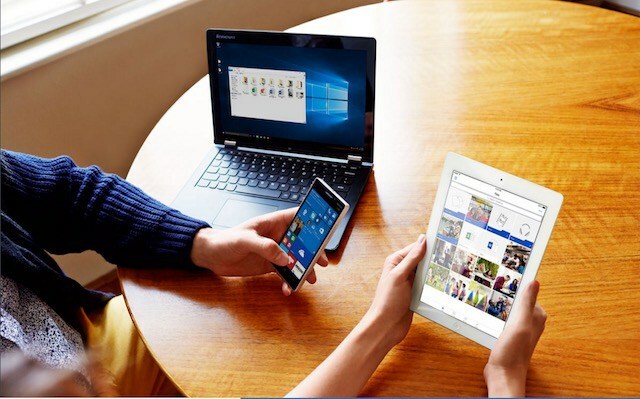 Dropbox alternatives: Dropbox being the best of all the cloud storage presented in the social and digital world as it brings out the easy access to the use by storing and securing and sharing all the data. Storing the personal info and accessing it anywhere at any time you want. Being accessible every where it is simplest cloud storage available that can beat the many competitors. Well, as every purpose made has some flaws and you will go confused in finding the alternative with same of its features or resembling the same. Finding an alternative is not that tough but finding the correct alternative for your purpose could be a matter to think on. Here is the article which can help you in sorting out the best alternative which suits your requirements for the storage purpose. If someone is looking for the storage purpose of the personal use, then the google drive acts as the best alternative to the dropbox for the user. As there is the obvious question in the minds of the users that how it is the best of the alternative to the dropbox. Taking in consideration the storage capacity offered in the free version of the dropbox is only 2GB as google drive offers the 15GB of the space to access your storage, the thing here is that is gets connected to all the services offered by the google and store the information from there too, this is vast preference as all information get stored and can be accessed anytime. On the other hand, you all can get the access to all the productivity tool by the google like, google docs, sheet, calendars etc. this means that not only you can store and share your data in the drive you can also create any document in itself as you want to. When the owner puts money on its thing with the confidence that you cannot breach its product than from that you can determine its accountability. Same is with the Tresorit, there is $50000 bounty for anyone breaching the product. As per the confidence, Tresorit provides the clear space to your privacy which is required by many. 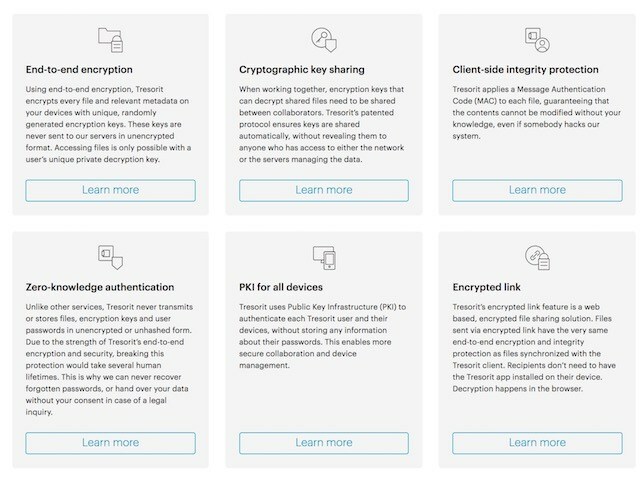 Tresorit offers the end to end encryption of the data which is the basic security thing a user searches for in the cloud storage service, and yes which is not offered by the dropbox and google drive. This encryption offers you the access that if you have to share these files with anyone else, he/she can only take the access when they are having the passwords for there file. This cryptographic key sharing technology also offers the non-sharing of the encrypted key and don’t even save this key for the access by anyone else. If the user takes the priority of using security and usability on equal basis, you can go for the Sync.com as it provides the best of its user access contents and yes can be considered best of the tresorit. People get confused of the .com specification at the end of the name of the drive but it also offers the applications to all the major operating software. 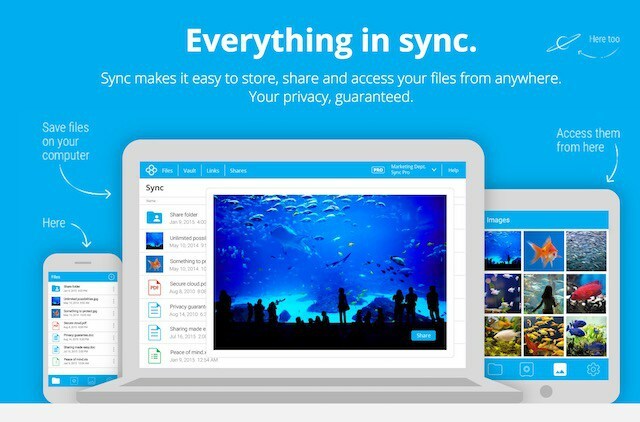 Sync.com believes in the collaboration of the files that can be encrypted and can be used by other people not as user accessible content but on the other basis. It’s up to the collaborator to give which right to whom as per the requirement. Being the free for usage it offers 5GB of its usage and you can pay for the unlimited access. I know you were waiting for it as it is the common one with same functionality of dropbox and google drive. One drive offered by the Microsoft the king of the productivity tools can help you to store even more of the word and the excel file. If you are a writer or student or the professional, you can go for this. Just like the google drive, one drive offers the 15GB usage and storage capacity to the users with the free version. OneDrive also comes with the inbuilt application of note support which helps you to create the short notes any time and at any place you want. Being a student or the person who looks for the listing down the thing the OneDrive is best option for them. Box is that dropbox option which could have been eliminated if dropbox comes with the facility of business as a user not the individual one. Box is made with features that keep business in mind and perform accordingly. Box has the inbuilt Microsoft tools suits which allows you to edit your documents online itself, you don’t need to download it anyway. As soon as you log in to the account or you create a new account you can have the access to the box from the website as well as the applications available on the respective platforms. 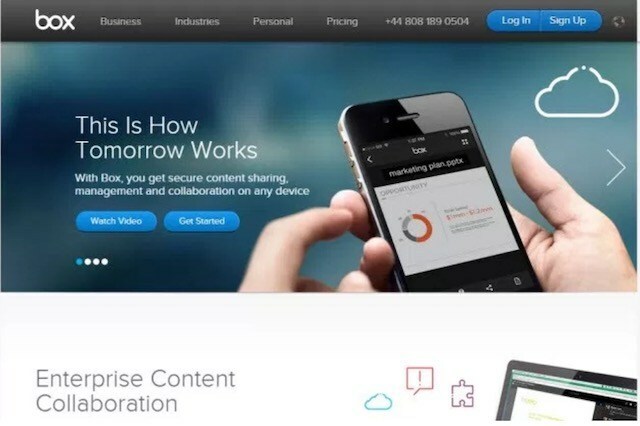 The difference comes up for the box so that it can be distinguished from other cloud storage services is that it is for business and collaborating the business tools from the anywhere file is the easy task for the box. Hence being the paid version will obviously offer the unlimited access but the free version gives 10GB as the overall data to be accessed for the small business purposes. Considering pCloud as the swiss company, it is still unknow in terms of the cloud storage world, but is still the ranker in the list of best DropBox alternatives. It not only comes with the performance of providing storage as their flexible paid subscription it also offers the special features according to the user needs. The surprise it comes up with is to provide the best security feature. This feature is divided and its components are unlocked by the time you get upgraded from free to premium version. Premium version is pcloud crypto which is available with price of $3.99 per year. Other than the security feature available with pcloud is that it provides you the feature that you don’t need to add any separate folder, it synchronises in such a way that brings ease in storing the data already separated. Still you won’t believe it, let’s go through its customers list, it is being used by coca cola, snapchat, LinkedIn and many more. So, think wisely. 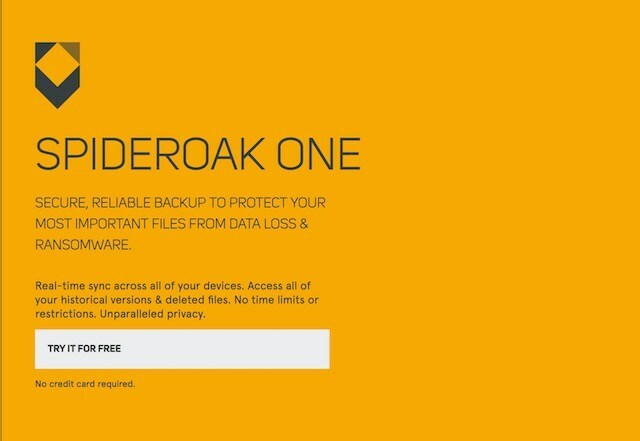 Spideroak one is among the alternatives that focusses on the data securing. Being trustable for the users its security rellies in the end-to-end encryption and zero-knowledge service which is the main thing as feature required to the user. This app is bit complex to be used by the users as it offers the manual setting change option to the user so that the he can dignify the requirements according to it. Its sync is bit slower than other apps, no matter, spiderOak one holds the side of being cost more. Its free trial feature is available for 21 days and they are enough to make yourself upgraded to premium one. This app is basically for the people who enjoy more of the free services and more the free service provided by the app, here is something good for you as mega offers the 50GB storage space in its free version, you got that right it is way more than the dropbox. Its also supports you with end-to-end encryption and also allows you to perform and access with any device other than yours. Focusing on the security it also provides in app chat function so that you can communicate with other collaborators without leaving the app. Cool!! Norwegian based company, jottacloud, claims to be the best cloud storage service that provides the unlimited storage capacity to its users. Well, if you go with the free version its only 5GB you will get for the purpose until you upgrade it and can access unlimited storage. It also offers the feature of syncing and backing up all your photos, so you don’t need to crate any separate folder for it and yes you can operate it with any device. Team drive according to its name is for the multiple people accessing it for a common purpose. This is possible with its exclusive feature of choosing your cloud hosting service, yes you can go with there service or you can create your own server that can be accessed by any of your team member. Well being a drive it also focusses on security of the users supporting 256-AES algorithm, with zero-knowledge privacy with encrypted end-to-end service. All in one setup. Hope this article would be greatful for your purpose choose wisely and, in any doubt, do leave the comment and views in the section below. I would be happy to help you for this.